I don't think there's a problem with reporting what the show mentioned. I'm pretty loathe to call real-life stuff "Spoilers." I'm curious what they reported as a rare cause of death. Me too. This isn't a new Star Wars movie. I would very much like to know what was said. Nothing too drastic or different really.....the doctor who performed the autopsy said he believed it was a relatively rare for of shallow water drowning(not really sure how they differs from drowning in general) which he said occurs in shallow water with excellent swimmers who are gasping for air. Again, the alcohol in his system, at .26, likely attributed to all of this, along with an enlarged liver from the alcohol, and that's what he said. Nothing outlandish. It's very similar to what has been reported and what many of us thought.....at least that was my take on it. Sorry if I ruined or "spoiled" the ending for others, but seems most who couldn't watch it wanted to know and like I said, it was determined it was a form of drowning, which we al knew, along with the accompanying circumstances. He indicated it was a cold water blackout and subsequent drowning. Repeated dives, high blood alcohol levels, and reduced oxygen flow likely caused a blackout. The cold water temp caused the body to consume oxygen more rapidly and the alcohol reduced his ability to realize his condition. Yes Needle, thank you for posting the link. It was interesting, no mention of Dennis hitting his head or being found curled up. The reason for the drowning was very plausible and certainly well explained. I learned something about Shallow Water Blackout and it is easy to see how it could happen. As the pathologist said Dennis probably swan under the influence before so it was more than that. The technique used for holding his breath over a prolonged period, led to the reduced oxygen, coupled with a reduction in CO2 means the body doesn't realise it needs more oxygen and just blacks out. The damage to the brain has already occured and leads to brain damage or death within a few minutes, unless the victim is pulled from the water. Then after the blackout the lungs open for air and get flooded with water, leading to drowning. At least Dennis probably didn't suffer or know much about it. People have speculated in the past about Dennis giving up. It would be possible for a person to knowingly put themselves at risk of SWB but I don't think this happened with Dennis. It was a tragic accident. Am I going mad, or did I not hear this correctly? Near the beginning of the show, the coroner (Michael Hunter) was saying that "taking a first look at Dennis' body... he has a strong swimmers physique for someone who's 39 years of age... and he looks in great shape. Then he said, "At first glance, I don't see any obvious reasons why he was found dead in the water just five days later." Shouldn't that have been "five days earlier"? Unless the coroner was checking out Dennis five days prior to his death, of course. Besides being really creepy, if that was the case, I think REELZ would have immediately developed a show called "Michael Hunter: Psychic Coroner". Seriously though, I think the better statement would have been "just 5 days after leaving St. Johns Rehab" or something similar. But then he also said, "Of all the Beach Boys, Dennis was the only one who actually surfed." I have read various accounts through the years where Mike, Al and Bruce also surfed. Perhaps nowhere near the level and proficiency of Dennis, but Mike recently said Bruce still surfs. Hey, Still Surfin'... they should write a song about... nevermind. There's a difference between going surfing a couple of times and actually being a surfer, I guess. Dennis was the only one who was actually taken as authentic by the surf community. Bruce was (and still is) of course also a surfer. But he's not an original Beach Boy. The story of Dennis being the only surfer in the group focuses on the original 5/6 guys. Although I am a little unsatisfied with what they say about the Beach Boys band, I think for a TV show this was good. It brings Dennis (and hopefully his music) into people's minds and also his tragic story. This really is not meant tactlessly, but Dennis' death alone and the days leasing up to it would probably make an interesting movie. There's so much drama. It took me years to realize that him diving and coming up with old keepsakes was what actually did happen and not just a movie dramatization. And that whole sad ending to such a vibrant personality. And the Dr said he had a swimmers body? Wasn't Dennis way out of shape at this point in time ? That was the first time I've ever seen an episode of this Autopsy show, and I'm sorry but I don't buy for a second that that forensic pathologist is an actual doctor. Where did he get his MD, the University of The Young and The Restless? The way he pulled his glasses out to read the "report"... oh come on. And I feel like they borrowed details from Brian's life to fill out their story and create possible other "reasons" for what happened. I mean, I'm not saying Dennis couldn't have had anxiety but if he left the tour in the early days because of a panic attack, isn't that something that would be documented? That was the first time I ever heard of anything like that, and I feel like it's something that would be known. But I agree that if this episode brings attention to Dennis and his music, that's a good thing and I suppose I shouldn't talk smack about it. I just disliked the way such a tragic event was recreated and treated. Ed, did Dennis ever write songs on a guitar in real life? I wondered about that too Donny! 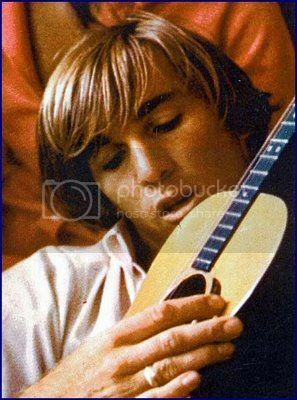 As he was practically homeless at that point in his life maybe he used the guitar! I doubt in those days leading up to his death he was trying to write anything! Son Of A Beach Boy - Scott Wilson/Karen Powell 2015) from information provided by Carole (Scott's mum & Dennis first wife). Screenshots from kindle cloud reader - linking rather than direct posting so people can choose whether they want to read it it. Were Dennis's panic attacks completely unknown to Beach Boys scholars until Scott wrote about them? I've never seen them discussed here before. If Dennis was "sent home," who filled in for him, the way someone had to fill in for Brian when he went home? Are there recorded Dennis absences from a show(s) in the 60s? It's interesting that Brian is known as the brother with the anxiety issues, and that his airplane incident is considered a major event in his emotional life, but Dennis's issues weren't known or talked about. It also makes me wonder whether Brian and Dennis, who shared this disorder, ever talked about it...or, if they weren't comfortable talking about it, if it increased their mutual empathy. iirc he missed @ a couple of shows attributed to injury from something being thrown at him on stage. about being on the same bill at a later show, Dennis looking scared and running off stage, after a similar incident. Thanks - I haven't read it. Will have to. Seriously, though, with a show of this nature, there wasn't any way they weren't going to go after the sensationalistic aspects; that's how they draw an audience. That does seem to be the formula with many shows lately. If they trying to prove a hoax (Fact or Fiction) they will strike out a few times before finally figuring it out. If they are showing potential buyers houses, they show a few clunkers first before finding the dream house (Love It Or List It). Even Dr. House (House, M.D.) would misdiagnose a few times before eventually nailing the solution. So yeah, I felt it was a way of building suspense as to why Dennis died. Although it was interesting hearing the story of the events preceding his death, some of it was too obvious and REELZ tried to make it more difficult than it had to be, and due to the writing, Dr. Hunter looked dumb sometimes. "Dennis was a drinker, so I wanted to see if alcohol played a role..." Well, the BAL is right on the autopsy report, so at .26 - three times the legal limit - I would say "yeah, alcohol played a role." Just like the statement of how would a seasoned surfer/swimmer drown in "just" 15 feet of water, when other rock stars have died choking on their own vomit. Jeez, drowning in water that is 15 feet deep is not far-fetched at all. So a little overly dramatic, but still interesting scenarios. My gripe is they could not use Dennis' music and highlight some of his songs. He had a beautiful heart and that shows in his music. Instead they play "I Get Around". I realize they wanted to play a song that people would instantly identify with the band, but his music was drastically different from the early 60s stuff. Hopefully folks will be intrigued enough to search for some of his stuff, because it is will touch their souls. That was the first time I've ever seen an episode of this Autopsy show, and I'm sorry but I don't buy for a second that that forensic pathologist is an actual doctor. Where did he get his MD, the University of The Young and The Restless? LOL The way he pulled his glasses out to read the "report"... oh come on. Nevertheless, Dr. Michael Hunter is a medical examiner that does this in his spare time. Check this out. Think they've conflated two incidents (having to leave a tour & being hospitalised as a teenager) but it's in the earlier editions of Scott's book - (Son Of A Beach Boy - Scott Wilson/Karen Powell 2015) from information provided by Carole (Scott's mum & Dennis first wife). Wow! Thank you so much for taking the time to post these. I really appreciate it! And I'm sure many other readers do as well. Honestly, I was pleasantly surprised by this show. Yes, it would have been cool to hear a snippet from POB or Bambu, but I don't typically expect it in programs of this nature. They did play a snippet of Never Learn Not To Love. And, as far as Manson goes...I think it's possible to tell The Beach Boys story without ever mentioning his name, but can we really say the same about Dennis? Unfortunately, it's part of his life. If we are going to speculate about the factors that contributed to his emotional state later in life (such as being abused by Murry or losing his voice), I don't understand how anyone can be expected to ignore that connection. It most likely haunted him the rest of his life. I didn't mind the approach the show took (considering numerous possible scenarios before reaching a conclusion), in fact, I commend it. Most people don't know the details of his death and it explains how he reached his conclusion. I was actually in suspense during that last commercial. I didn't know he was going to say Shallow Water Blackout. It gave me something to think about. I do believe that is the most plausible explanation of his death and it conforms to the general understanding that alcohol/drugs/cold water contributed to his accidental drowning. I also found it interesting and read up on Shallow Water Blackout. ^This is a good link. I recommend anyone to check it out. It's particularly plausible, because it doesn't necessarily hinge on Dennis being aware of (as an experienced swimmer) and utilizing that technique (something we will never know) because overexertion can have the same effect. I was also curious to find out to what extent the cold water contributed to his death and Dr. Hunter explained that. That water was cold! I'd need a wetsuit to stay in for more than a minute or so. I totally agree, Rocker. My problem is when people dismiss the Beach Boys music by saying, "they never even surfed!" or something like that. But Dennis was the only surfer in the group. I still prefer that people acknowledge that other members did surf on occasion, but oh well. I honestly don't see the relevance anyway. Did they go to the beach? That's enough for me. This was all very interesting, considering there was really no new information. I must have dreamt that they played You and I in its entirety during this program. Powered by SMF 1.1.21 | SMF © 2015, Simple Machines Page created in 0.295 seconds with 21 queries.